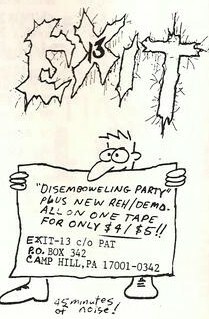 Exit-13 was a grindcore band from Millersville, Pennsylvania. The band were formed in 1989 by Relapse Records founder and co-owner Bill Yurkiewicz (vocals), guitarist Steve O'Donnell and bassist Joel DiPietro. Their early recordings, including the Disembowelling Party, The Unrequited Love of Chicken Soup and Eat More Crust demos (all 1989), their debut fully-length Green Is Good (1990) and the EPs The Unrequited Love of Chicken Soup (1990) and Spare the Wrench, Surrender the Earth (1991) featured a line-up of Yurkiewicz, O'Donnell and DiPietro, with drum duties being shared between Bill Schaeffer and Pat McCahan. Exit-13 underwent a line-up change prior to 1994's Ethos Musick, and recruited the rhythm section of Dan Lilker, famous for his work with Anthrax, Nuclear Assault and Brutal Truth on bass guitar, and his Brutal Truth band-mate Scott Lewis on drums. Brutal Truth's vocalist Kevin Sharp also provided backing vocals. The band's lyrics mainly focused on environmental issues (with open support to radical groups like Earth First! ), but also concentrate on social issues.